Carbohydrates are biological macromolecules that are made up of smaller molecules, called monomers. Carbohydrates include sugars, starches, and fibers. They are symbolized by the formula (CH2O)n. According to this formula, carbohydrates are made up of carbon (C), hydrogen (H) and oxygen (O) atoms in the ratio 1:2:1. Carbohydrates are considered to be the fastest and most basic way to obtain energy. Carbohydrates are used for storing energy in living organisms’ bodies until they require it. Plants store carbohydrates in the form of starches. On the other hand, carbohydrates are stored in the human body and animals’ bodies in the form of glycogen in the liver and muscles. Carbohydrates are a basic component for some parts of the cell, such as cellulose in the roots of plant cells. Carbohydrates are also found in cell membranes and in the protoplasm of a cell. Monosaccharides are the simplest type of sugars. They are made only up of one molecule. This molecule is made up of a chain of carbon atoms. Each carbon atom is connected to oxygen and hydrogen atoms in a certain way. The number of carbon atoms in monosaccharides ranges from 3-6 atoms. Examples of monosaccharides are glucose, fructose, galactose, and ribose. In general, monosaccharides are soluble in water, have a low molecular weight and have a sweet taste. n = 3, trioses, e.g. glyceraldehyde. n = 5, pentoses, e.g. ribose and deoxyribose (‘pent’ indicates 5). n = 6, hexoses, e.g. fructose, glucose and galactose (‘hex’ indicates 6). There is more than one molecule with the molecular formula C5H10O5 and more than one with the molecular formula C6H12O6. Molecules that have the same molecular formula but different structural formulae are called structural isomers. Glucose is the most important carbohydrate fuel for human cells. Its concentration in the blood is about 1 gdm-3. The small size and solubility in water of glucose molecules allow them to pass through the cell membrane into the cell. Energy is released when the molecules are metabolized. This is part of the process of respiration. Living organisms obtain energy stored in carbohydrates when the glucose molecules are oxidized inside the cells (mitochondria), and the energy stored in its chemical bonds is released in the form of a compound called adenosine triphosphate (ATP). This compound is transferred into other places in the cell so that the energy stored in it can be used. 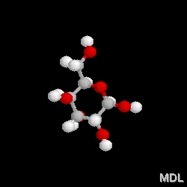 Two glucose molecules react to form the disaccharide maltose. Starch and cellulose are polysaccharides made up of glucose units. 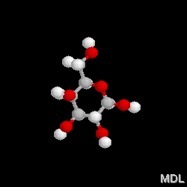 Galactose molecules look very similar to glucose molecules. Galactose reacts with glucose to make the disaccharide lactose. However, glucose and galactose cannot be easily converted into one another. Galactose cannot play the same part in respiration as glucose. This comparison of glucose and galactose shows why the precise arrangement of atoms in a molecule (shown by the displayed formula) is so important. Fructose, glucose and galactose are all hexoses. However, whereas glucose and galactose are aldoses (reducing sugars), fructose is a ketose (a non-reducing sugar). It also has a five-atom ring rather than a six-atom ring. Fructose reacts with glucose to make the disaccharide sucrose. Ribose and deoxyribose are pentoses. The ribose unit forms part of a nucleotide of RNA. The deoxyribose unit forms part of the nucleotide of DNA. Two monosaccharides molecules are linked to each other to form a disaccharide molecule. Examples for disaccharides are sucrose, which is made up of a glucose molecule linked to a fructose molecule, lactose, which is made up of a glucose molecule and a galactose molecule, and maltose, which is made up of two glucose molecules. Its length (though they are usually very long). The extent of any branching (addition of units to the side of the chain rather than one of its ends). Any folding which results in a more compact molecule. Whether the chain is ‘straight’ or ‘coiled’. Starch is often produced in plants as a way of storing energy. It exists in two forms: amylose and amylopectin. Both are made from α-glucose. Amylose is an unbranched polymer of glucose. The molecules coil into a helical structure and it forms a colloidal suspension in hot water. Amylopectin is a branched polymer of glucose and is completely insoluble in water.